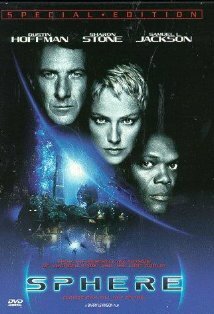 I had avoided watching Sphere for a while, because of its cast - Dustin Hoffman, Sharon Stone, Samuel L. Jackson. Not that the three were in any way bad actors. On the contrary, when you have such strong performers packed into a science fiction movie, and it doesn't turn out to be spectacular - it is usually bad. Unfortunately, the movie lived up to my worst fears. Sphere is based on a Michael Crichton novel, and is the story of four scientists who are commandeered to help investigate a strange craft lodged in the bottom of the Pacific ocean. Upon arrival, they realize that the craft is not alien, but from the future, and has in its cargo a large, alien, golden sphere. As the scientists are exposed to the sphere, and deadly accidents begin to take place thousands of feet underwater, they have to figure out the cause of these accidents or accept the fate that none of them will ever see the outside again. The problem with idea-driven science fiction novels - like this one - is that there are so many ideas to be explored and discussed, that there is very little time for character definition. Further, the entire narrative seems force fit to discuss the concepts, and seems rather artificial and stunted. For a viewer, that makes it extremely difficult to care about what is happening on screen. That was the case with Sphere. A lot of wondrous happenings did take place, but it was like a forced march that left one too tired to care for the scenery. Having too many stars only worsened this. Everyone had so many dialogues to speak that there wasn't much listening going on. That is not to say there was nothing good to come from the movie. The concept itself was though-provoking. The idea that an alien could be truly alien without a physical manifestation is powerful, which the movie was able to explore rather well. And if you were looking for a great documentary without a voice-over, then this would be it. As a thriller ... it could use more character and fewer stars.